FIFTY ONE rural artisan women will now be able to obtain the Fijian made emblem for their products and further expanding their reach to new and potential markets. This was after they were handed their Fijian Made Crafted licence at the Fiji National Women's Expo at the Vodafone Arena in Suva yesterday. These include those from rural areas within Viti Levu and Vanua Levu including the maritime islands of Lomaiviti, Kadavu, Lau and Rotuma. It was particularly a proud moment for Juria Henry, a 54-year-old artisan from Malhaha in Rotuma, who were part of the group that received their licences. Ms Henry is part of the 14-member delegation all the way from Rotuma to attend the three-day expo. I feel proud because I came all the way from my island just to be here and receive this certification," she said. "I am also proud that this will add value to the handicraft from my island which is a gift from God to my ancestor." Ms Henry said it would now be challenge for her to keep and maintain her products according to the standards under the Fijian-made branding. Meanwhile in handing over the certificates to the women, acting Prime Minister and Attorney-General Aiyaz Sayed-Khaiyum reminded the women to maintain the consistency of their products. In this regard, we are indeed grateful for the collaboration, to develop each individual artisans and women's groups to recognise our skills and talents..
"It gives you the economic opportunity, it gives you the ability to increase your wealth, ability to make your products then at the same time get a value for it," he said. "So you become less dependent on people and husbands, and welfare. It has a multiplier effect." 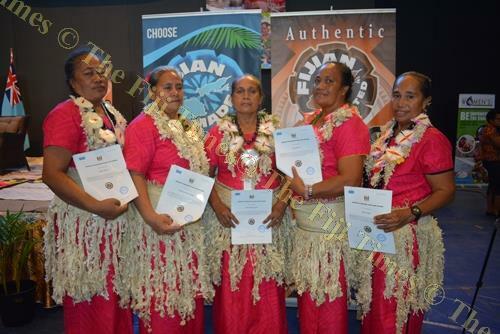 Thirty more women were also identified from the FIji National Women's Expo and will be soon handed their Fijian Made Crafted licence. The "Fijian Made and Buy Fijian Campaign" was mooted by the Fijian Government through the Ministry of Industry, Trade and Tourism in 2009. This was to primarily promote and raise the profile of Fijian made products and produce, both domestically and internationally through a national branding strategy. The 'brand' is categorised with different representations, each having to meet a certain compliance criteria as endorsed by Cabinet in 2011. To overcome the lack of communication with its volunteers, Fiji Red Cross Society will soon open up offices on Rotuma and Rabi. And the Fiji Red Cross Society director general, Filipe Nainoca said the society was already in talks with the local partners to establish a proper and continuous communication network on the island. “We are building an office in Rabi and will establish communication with the island by introducing ham radios and we already beginning talks with communication partners,” Mr Nainoca said. On the other hand, the Rotuma branch president, John Low confirmed that they had received building materials on the island and would soon start building the office. “Rotuma Red Cross livened up after Tropical Cyclone Winston and has been active since then. We have seen the need for an office where people can liaise with us,” Mr Low said. He said since the cyclone, there were a few projects on the island implemented by the Red Cross members in the districts. Meanwhile Fiji Red Cross Society is about to finish off its Tropical Cyclone Winston appeal funds. This amounts to around $8 million, in assessment and effort to rehabilitate and assist the communities. “Our TC Winston appeal is finishing off in July and two days ago we met with our partners to see how Fiji Red Cross can continue to work because Fiji Red Cross saw the need for the people continuing,” Mr Nainoca said. The case against the chairman of the council of Rotuma and two others has been sent to the Rotuma Magistrates Court. Chief Magistrate Usaia Ratuvili released the chairman of the council of Rotuma Tarterani Rigamoto, Sainimeli Tivao and Penamino Tavo to return to Rotuma. Magistrate Ratuvili also said the trial will take place next year in Rotuma because all the accused were from there. However, the pre-trial conference will take place in Suva but the three accused have been excused. Rigamoto is charged with a count each of abuse of office and giving false information derived from false documents. It is alleged that Rigamoto, between June 1, 2016 and March 31, 2017, on Rotuma Island, caused the investment of the council of Rotuma with Fijian Holdings Unit Trust to be the security for REMCOL loan in the sum of $250,000 without the approval of the council of Rotuma. It is also alleged that on July 4, 2016, Rigamoto dishonestly gave false information to the Merchant Finance Ltd.
Tivao is charged with aiding and abetting. It is alleged that Tivao, on July 4, 2016, on Rotuma Island, aided and abetted Rigamoto in commission of the offence of giving false information derived from false documents, dishonestly giving false information to the Merchant Finance Ltd that the council of Rotuma had unanimously agreed to support REMCOL in their application for finance assistance and to be the guarantor of REMCOL loan of $250,000. Tavo is charged with giving false information. It is alleged that Tavo, on November 24, 2016, on Rotuma Island, gave false information to the Rotuma council in its fourth quarterly council meeting held under section 13 of the Rotuma Act that the REMCOL has production earnings in the sum of $33,000 which he knew was false or misleading. The case has been adjourned to June 23, for mention. After decades long anticipation, the ground breaking ceremony for the construction of the new sealed runway in Rotuma took place yesterday. The total project cost is estimated at $13 million with completion programmed for March 2018. 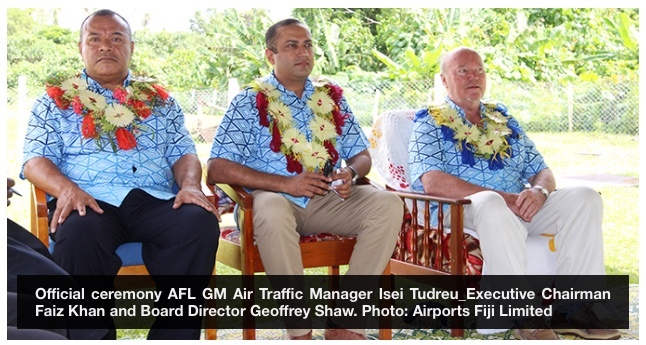 Government has given a grant of $2.3 million and the rest is paid by Airports Fiji Limited (AFL) as its contribution as a Government-owned entity. "Once completed, this project will transform the Rotuman economy bringing with it developments and economic activities," Mr Khan said. "Travelling here today in the Fiji Link Twin Otter cost us $23,000 in charter fees. "We were not sure until a few minutes before departure whether the pilot would bring six or seven of us or not at all, depending on weight and weather conditions. Larger aircraft such as ATRs cannot operate out of Rotuma at present, but will be able to do so in future after the upgrades. "After the upgrades ATR 72s will take around 70 passengers with greater certainty on flight times and frequency. "One can only envision the transformation this will have for Rotuma. The distance between Rotuma and Nadi is around 600 km but at present feels like 60,000 kms. In the future Rotuma will be a destination just around the corner. "Before we landed today we saw the best blue colour ocean we have ever seen in our lives. 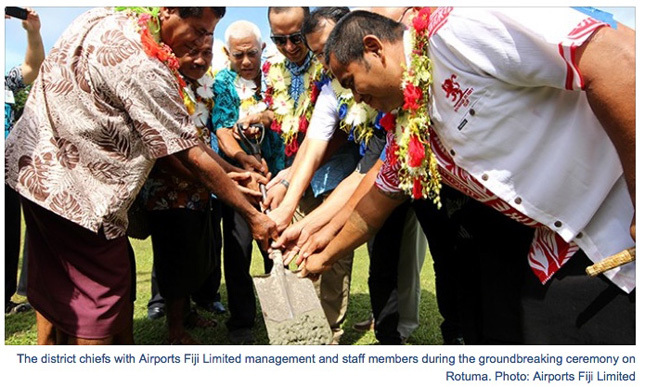 "Rotuma has a treasure of opportunities that this runway sealing project will open up for the people of Rotuma. "The project has been made possible through the push and vision of the Government. There is no business case for AFL to develop Rotuma but we do so due to our social responsibilities as a Government owned entity. "For your information the current landing fees for a Twin Otter is $15.18. "So this aircraft we came in would pay AFL $15.18 for landing in Rotuma today. In a year there are around 70 flights. 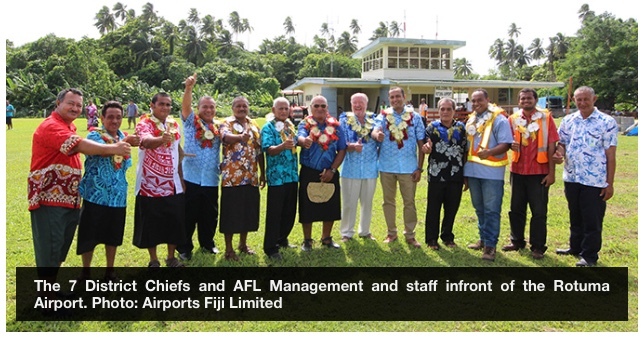 "So that currently amounts to around $1000 in gross landing fees revenue per annum for flight into Rotuma. AFL heavily subsidises all domestic air travel as part of its social obligation. "This project is further evidence of Government's inclusive and long term approach. It shows that the focus of Government is not just on mainstream Fiji but the entire nation. "We are thankful for the honourable Prime Minister and our Ministry of Public Enterprises' directives, support and guidance. "We anticipate this project will have many challenges due to its isolation. To overcome them we will need collaboration between all stakeholders – the people of Rotuma, the contractor China Railway 5, the project manager consultant GHD, the Government officials, the District Office in Rotuma, the Ministry of Lands, the Ministry of Public Enterprises, the Department of Environment, AFL reps involved in the project, and everyone else involved. The Reverend's theme in leading the prayer was very apt for this project:- Be safe and keep focus," said Khan. "On behalf of the Government, our board of directors, staff and all other stakeholders we would like to thank the seven district chiefs of Rotuma, the landowners and people of Rotuma for your hospitality and kindness in welcoming us today," Mr Khan said. The Rotuma runway project has already boosted the islands economy with 22 locals being engaged to work for China Railway 5th Engineering Group Co. Ltd with recruitment expected to further increase as construction commences. Rotuma district officer Niumaia Masere said the economic benefits from the runway upgrade will create enormous opportunities. "It's going to open up other developments like tourism and export. Rotuma has a bilateral agreement with Tuvalu and with transportation being made easier the export of commodities will increase," he said. High chief of Noatau Gagaj Maraf said: "This has always been a dream for decades it's now a reality for our people. We are all excited and the benefits from this project will be immense." The secretary of the landowners Jioje Fiu said: "On Wednesdays and Fridays we have about 12 to 13 people who wait to board the flight but there are only five seats available and most of the time our people go back home disappointed. "This is the answer to our travel woes that we have faced for many years. "We hope with the runway upgrade and with the arrival of bigger aircraft the airfares will also be cheaper." After decades long anticipation the ground breaking ceremony for construction of the new sealed runway in Rotuma took place today. 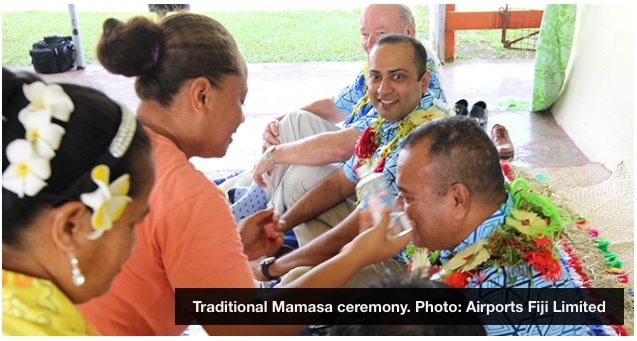 Executive Chairman of Airports Fiji Ltd, Faiz Khan said this is a historical day for the people of Rotuma and the Fijian nation. Currently, larger aircraft such as ATRs cannot operate out of Rotuma at present, but will be able to do so in future after the upgrades. The Rotuma runway project has already boosted the islands economy with 22 locals being engaged to work for China Railway 5th Engineering Group Co. Ltd with recruitment expected to further increase as construction commences. Rotuma District Officer Niumaia Masere said the economic benefits from the runway upgrade will create enormous opportunities. “It’s going to open up other developments like Tourism and Export. Rotuma has a bilateral agreement with Tuvalu and with transportation being made easier the export of commodities will increase,” Masere highlighted. “This has always been a dream for decades it’s now a reality for our people. We are all excited and the benefits from this project will be immense,” said the High Chief of Noatau, Gagaj Maraf. The total project cost is estimated at $13 million with completion programmed for March 2018. The Chairman of the Council of Rotuma,Tarterani Rigamoto and two other people appeared in the Suva Magistrates Court this afternoon after FICAC charged them with corruption related offences. Rigamoto is facing a count each of abuse of office and giving information derived from false documents. Sainimeli Tivao is charged with aiding and abetting while Peniamino Tavo is charged with giving false information. It is alleged that between the 1st of June 2016 and 31st of March 2017 in Rotuma, Rigamoto caused the investment of the Council of Rotuma with Fijian Holdings Unit Trust to be the security for Rotuma Export and Marketing Company Limited or REMCOL loan in the sum of $250,000 without the approval of the Council of Rotuma. Rigamoto also allegedly gave false information to the Merchant Finance Limited that the Council of Rotuma had unanimously agreed to support REMCOL in their application for financial assistance and to be the Guarantor of REMCOL loan in the amount of $250,000. Sainimeli Tivao is alleged to have aided and abetted Rigamoto in giving false information to the Merchant Finance Limited that the Council of Rotuma had unanimously agreed to support REMCOL in their application for financial assistance and to be the Guarantor of REMCOL loan in the amount of $250,000.00. Penamino Tavo allegedly gave information to the Rotuma Council in its 4th quarterly Council meeting that the REMCOL has production earnings in the sum of $33,000 which he knew to be false or misleading. All three were granted bail on a bail bond of $2000. The matter has been adjourned to tomorrow to have the matter referred to the Rotuma Magistrates Court as all of them reside in Rotuma.